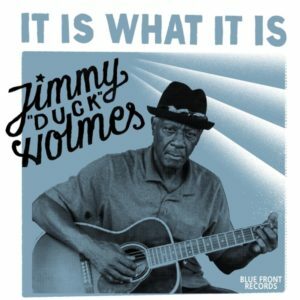 Home Music Reviews Album Reviews Jimmy "Duck" Holmes – Treats Us to "It Is What It Is"
Jimmy "Duck" Holmes – Treats Us to "It Is What It Is"
June 17th, 2016 is a special day at the historic Blue Front Cafe in Bentonia, Mississippi. It’s the day that country blues artist, Jimmy “Duck” Holmes is throwing a party to celebrate the release of his new album, It Is What It Is, on his own label, in his own juke joint. Let’s back up a bit and explain how this all came to pass. 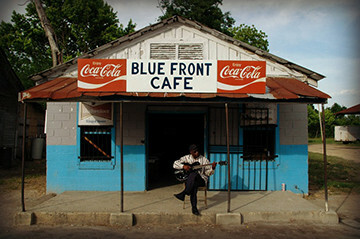 Holmes is the second generation owner of the Blue Front Cafe that was opened by his parents in 1948. Growing up in and around one of the most famous jukes in the South left a life-long mark on him, and that impression is known as the Bentonia blues. The music known as the Bentonia blues or, more formally, the Bentonia School, originated in the area when Henry Stuckey returned from World War I with a unique style of tuning and playing guitar. He learned the odd, open D-Minor and E-Minor tunings from Bahamian soldiers he met in France while serving there. The tuning caught on with several blues guitarists including Bukka White, Henry Townsend and even Albert Collins, but it was the pickers from Bentonia such as Skip James, that turned it into a haunting, droning art form. Enter Jimmy “Duck” Holmes, who often visited Stuckey next door to his family’s bar, and who learned the style from Stuckey himself, as well as other acknowledged masters of the craft, Jack Owens, Bud Spires, Cornelius Bright, and the handful of others who made this sound their own. 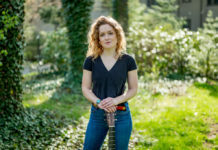 Fast forward to 2016: Holmes is now a legend in the country blues, who owns the Blue Front Cafe, and has recorded several successful albums on several labels. Now, he creates his own record label, Blue Front Records with a handshake deal in the juke itself, and records It Is What It Is, in his Blue Front Cafe. This album is as gritty, stark, and raw as one can imagine. Then again, that’s Bentonia and nobody plays it better than Holmes. Armed with electric, acoustic and 12-string guitars as well as his harp, he is a one man command performance. The music he plays is almost ethereal, and absolutely hypnotic. The recording is perfect for the genre, with his rhythm section made up only of his foot tapping the concrete floor, the barely audible clack of a ceiling fan, and his own voice and guitar resonating off the cinder block walls. Tracks that we especially liked on this release are the traditional covers that include the opening number, “Buddy Brown,” the ominously clean, “Evil,” and, the heavily distorted guitar sound of, “It Had to be the Devil.” Holmes is a master story-teller and songwriter in his own right and his originals, “Pencil and Paper,” and, “Love Alone” strike a primitive nerve. He is so steeped in the tradition, that even his song, “So Glad,” sounds oh, so sad. 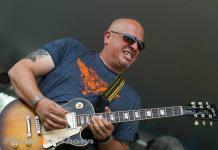 Only a smattering of artists perform this increasingly rare style of blues. Fewer still record it, and Holmes is one of the last. That being said, when you can get your hands on something this legendary, you do it, without hesitation. Then, you give it a prime spot in your play list.